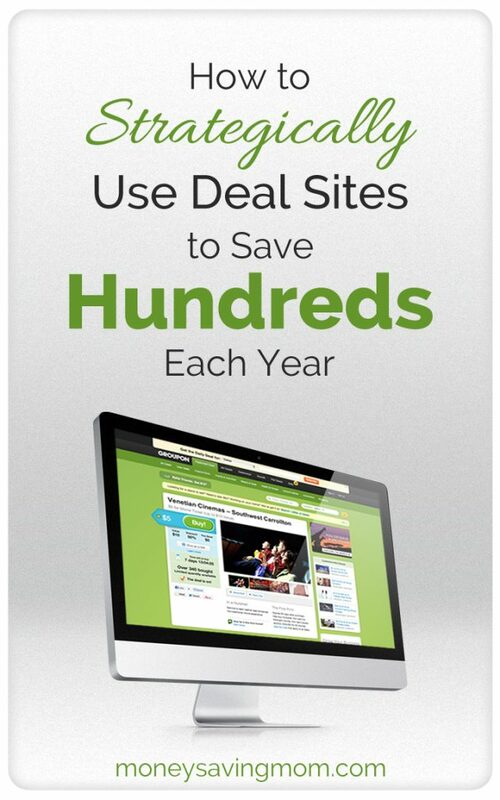 One way we stretch our dollars is by buying deals from daily deal sites. They can be a way to get amazing deals on restaurants, local attractions, family fun, local stores, and more! I don’t care how good the deal is, if you can’t afford it, it’s not a good deal for you. Daily deal sites only save you money when you actually buy deals that are for things you will use and have room in your budget for. For instance, if you allot a $50 monthly budget for eating out/family fun, you can stretch those dollars much further by buying Groupons or AmazonLocal vouchers for restaurants, bowling, and local attractions. But you still have to stick with the $50 budget. No cheating is allowed just because it’s a “great deal.” Otherwise, you’ve defeated the purpose and it’s not saving you money but encouraging you to spend more money. If you want to guarantee that you save $100 per year by using daily deal sites, cut your current eating out and entertainment budget by $10 per month for the next year and try to make the lower budget stretch with vouchers from deal sites. Unless you live in small town or you are really particular about what types of restaurants you’ll eat at or things you like to do as a family, I bet you can make the reduced budget work just fine! Always, always, always read the fineprint carefully before purchasing a voucher. Check the details on whether there’s a purchase minimum. Be sure that the voucher is good at your local store. And double-check that you’ll actually use the voucher before it expires. One good thing about Groupon is that they have amazing customer service and money-back guarantees. So if you do end up accidentally buying something that isn’t what you thought it was, you can usually get your money back. But I still recommend reading the fineprint with a fine-toothed comb and then taking a little time to think through the purchase and make sure it’s a good use of your money. Once you’ve determined that the voucher is, indeed, a good deal for you, be sure to purchase it through Ebates. If you’re unfamiliar with Ebates, basically it’s a site that rewards you with a small percentage of cashback on your online purchases. All you have to do is sign up for an account and then go to Ebates.com, search for the online store you’re planning to purchase from, and click through to the site to make your purchase. You’ll usually receive anywhere from 3% to 8% cashback on each purchase. It might not seem like much, but I think it’s worth earning a few dollars in cash back for taking an extra 30 seconds to click through to Ebates. Each quarter, Ebates will send you a check for your accumulated cashback amount earned over the past quarter. It’s always a fun little bonus — and it’s FREE money that you’re earning for making a purchase you were already planning to make! See a full list here of daily deal sites. What are your favorite daily deal sites? What tips and tricks do you have to add to my list? I love daily deal sites. They can help you save money in more areas than just entertainment and eating out. One of my favorites is Eversave. Once a year they usually have a Lucky Vitamin voucher which is where I get a lot of my supplements for my long runs and bike rides for much less than in store and the voucher makes the deals even better (Amazon local just ran this deal not that long ago). At Christmas time I always grab the Klutz Kids voucher and get a great deal on craft books for my daughter. With Groupon – which is the only one I use – you can sign up for more than one city’s deals. If you are planning a vacation, sign up for that city’s Groupons to get great deals on meals and museums! That is exactly what I did for this year’s family vacation! My sister and I are going on a girls weekend next month and I am watching every day for good deals. Found one so far. Hoping the “right” restaurant comes along before we go! I do the same thing and it has helped me save a lot of money. Really great for vacation meals or activities. I also like that Living Social has the option of sharing your deal with the possibility of getting your deal for free! You should still only purchase it if you have the money to afford it, but if 3 people use your link, your deal is completely free! I recently used Living Social to get half-off vouchers to a local store where I was planning on buying cloth diapers, but ended up getting my voucher for free – $24 for FREE to a store I was planning on spending the money at anyway! It’s important (imo) to be clear that you’re giving a referral link when you share the deal, but it’s worked out well for me several times! I love Zulily. Great deals on girls clothing and the styles you find there can not be found elsewhere. I’ve learned to opt out of the emails so I only go to the sites when I’m specifically looking for something. 🙂 We’ve bought a number of birthday and Christmas gifts from Zulily and saved more than 50%! I love My Habit. You get use your Amazon gift cards from Swagbucks and you get free shipping! The woman’s clothes are pricey but I’ve gotten great clothes, shoes and toys for the kids. Thank you so much for bringing back this series. I really looked forward to it. Check out ScoutMob. It’s not in every location, but it’s growing rapidly. The best thing about ScoutMob is – you don’t purchase anything from them! They arrange deals with local businesses and you just show them the mobile coupon on your phone when you’re there. It’s so much simpler than Groupon! And you can use it on the go…if I’m out and need to eat lunch, I always check the ScoutMob app for local deals. Most of the deals are 50% up to a certain amount.